With every healthcare IT executive struggling to get data from here to there, it’s critical to have an understanding of where the industry stands on this most important of issues. That’s because knowing what most folks are accomplishing in this area will let you know if you’re lagging behind, keeping up with the pack, or setting the pace. So join us as we hear industry leaders deliver an update on the state of interoperability. With your success in value-based care hinging on moving data across organizations and applications, this is one webinar you can’t afford to miss. Attend our live event and get your questions answered during our Q&A. Not sure you can make it? No worries – register today and you’ll receive an email the moment our archive is ready. About our Sponsor: Hyland Healthcare delivers a suite of unparalleled content and image management solutions to address the clinical, financial and operational needs of healthcare organizations. Globally, more than 2,000 healthcare organizations rely on Hyland’s world-class solutions and experience to connect diverse content to patient records, eliminate reimbursement delays and enhance business processes. For more information, please visit Hyland.com/Healthcare. 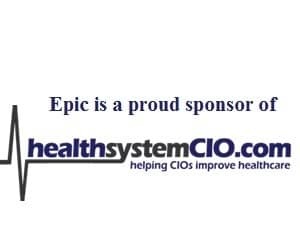 Continuing Education Credits: By attending healthsystemcio.com Webinars, you may earn up to 1 Continuing Education Unit (CEU) for the CHIME Certified Healthcare CIO Program. Other certification programs, such as those offered by AHIMA and NAHQ/HQCC, may also award CEUs for attending our programs. Check with your continuing education provider. Interested in learning more about our advertising programs? Subscribe to our Marketer’s Bulletin for the latest offerings and programs, review our Media Kit, or contact Director of Sales & Marketing Nancy Wilcox (303-335-6009). View our archived Webinars on YouTube. 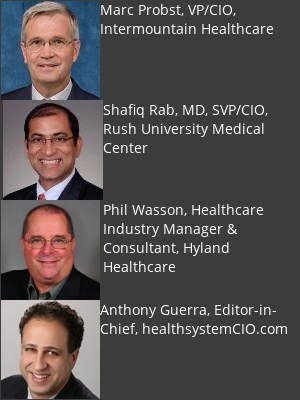 Join the healthsystemCIO.com Mailing List to learn of future events.